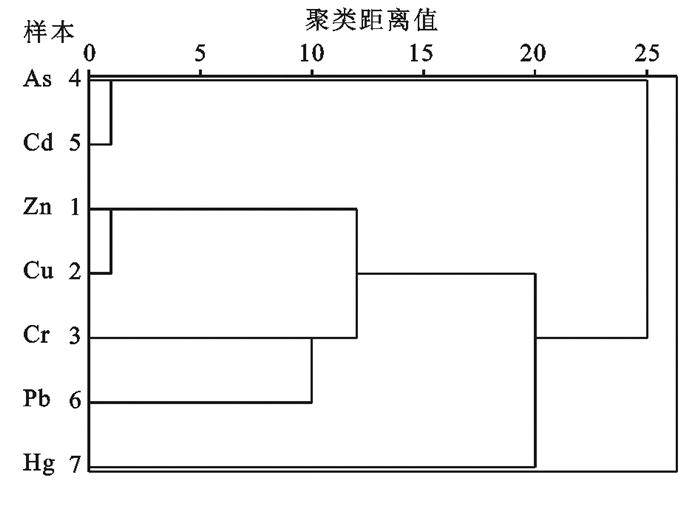 王清泉(1992-), 男(汉族), 安徽省宿州市人, 硕士研究生, 研究方向为水源地污染调查与评价。E-mail:18709841300@163.com. 王宁(1971-), 男(汉族), 安徽省安庆市人, 博士, 副教授, 主要从事水污染控制及源解析研究。E-mail:ningwang0001@163.com. 第一作者：王清泉(1992-), 男(汉族), 安徽省宿州市人, 硕士研究生, 研究方向为水源地污染调查与评价。E-mail:18709841300@163.com. 通讯作者：王宁(1971-), 男(汉族), 安徽省安庆市人, 博士, 副教授, 主要从事水污染控制及源解析研究。E-mail:ningwang0001@163.com. Abstract: [Objective] We aim to investigate the effects of heavy metals in surface sediments of catchment rivers in drinking water source areas (Dongpu reservoir and Dafangying reservoir) in Hefei City of Anhui Province on downstream reservoirs. [Methods] Twenty-three sediment samples were collected from three major river catchment to determine the concentrations of Zn, Cu, Cr, As, Cd, Pb and Hg. The potential ecological risk was assessed by the potential ecological risk index (IR) and cumulative index method (Igeo). 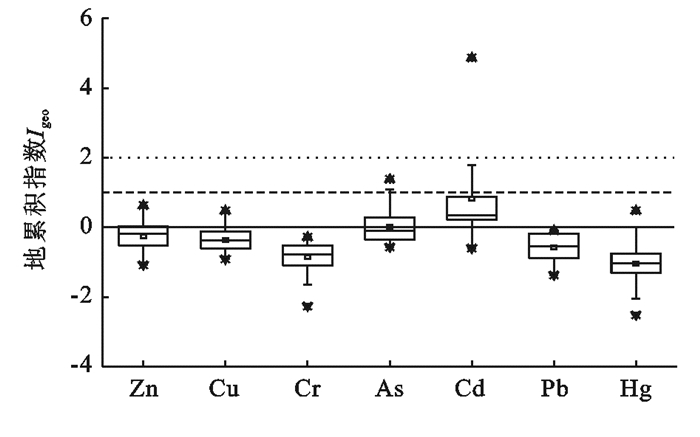 The principal component analysis was used to assess the possible sources of the heavy metals. [Results] The distribution of heavy metal in the study area was different. The contents of As and Cd in sampling locations of C1 and C2 on the Surabaya river exceeded the secondary standard limit of soil environmental quality for maintaining human health, and the available Cd in these two sites accounted for 34.97% and 37.67% of total Cd concentration, showing a strong biological availability. Cd ecological risk index was generally high, reaching the intensity level, among which C1 and C2 on the surabaya river reached the extremely strong level. 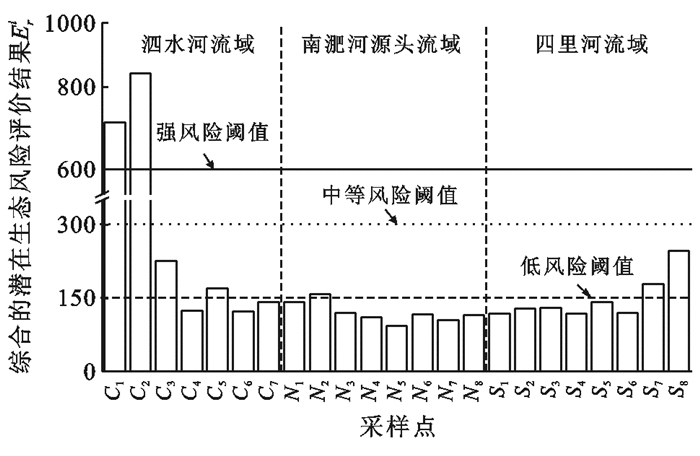 In addition, the ecological risk of Hg for location S8 reached the intensity level, and the ecological risk level of the remaining 6 heavy metals was relatively low. The heavy metals in this region mainly came from human-natural mixed sources and human-made sources, with contribution rates of 51.11% and 27.70%, respectively. [Conclusion] Cd pollution is more serious in the lower reaches of the Sishui River. In order to reduce its impact on the downstream reservoir, Cd pollution control should be strengthened. Zhang Yuan, Guo Fen, Meng Wei, et al. Water quality assessment and source identification of Daliao river basin using multivariate statistical methods[J]. Environmental Monitoring & Assessment, 2009, 152(1/4): 105-121. Birch G F, Apostolatos C. Use of sedimentary metals to predict metal concentrations in black mussel(Mytilus galloprovincialis)tissue and risk to human health(Sydney estuary, Australia)[J]. Environmental Science & Pollution Research International, 2013, 20(8): 5481-5491. Ali Z, Malik R N, Qadir A. Heavy metals distribution and risk assessment in soils affected by tannery effluents[J]. Chemistry & Ecology, 2013, 29(8): 676-692. Cooke J A, Andrews S M, Johnson M S.  Zhang Yuan, Guo Fen, Meng Wei, et al. Water quality assessment and source identification of Daliao river basin using multivariate statistical methods[J]. Environmental Monitoring & Assessment, 2009, 152(1/4):105-121.[J]. Water, Air, and Soil Pollution, 1990, 51(1/2): 43-54. Zhang Hong, Shan Baoqing. Historical records of heavy metal accumulation in sediments and the relationship with agricultural intensification in the Yangtze-Huaihe region, China[J]. Science of the Total Environment, 2008, 399(1): 113-120. 吴迪, 唐晓先, 王为东, 等. 巢湖柘皋河沉积物重金属分布特征与风险评价[J]. 安徽农业大学学报, 2017, 44(3): 448-457. Tang Wenzhong, Shan Baoqing, Zhang Hong, et al. Heavy metal sources and associated risk in response to agricultural intensification in the estuarine sediments of Chaohu Lake Valley, East China[J]. Journal of Hazardous Materials, 2010, 176(1/2/3): 945-951. 张兆永, 吉力力·阿不都外力, 姜逢清. 艾比湖表层沉积物重金属的来源、污染和潜在生态风险研究[J]. 环境科学, 2015, 36(2): 490-496. Müller G. Index of geoaccumulation in sediments of the Rhine River[J]. Geojournal, 1969, 2(3): 108-118. 中国环境保护部, 土壤环境质量标准GB 15618-1995[S].北京: 中国环境科学出版社, 1995. Wilding L P. Spatial variability: Its documentation, accommodation and implication to soil surveys[M]//Nielson D R, Bouma J. Spatial Variations, Wagenningen: Purdoc, 1985. Mamat Z, Yimit H, Aji R Z, et al. Source identification and hazardous risk delineation of heavy metal contamination in Yanqi basin, northwest China[J]. Science of the Total Environment, 2014, 493(3): 1098-1111. 刘海彪, 孔少飞, 王伟, 等. 中国民用煤燃烧排放细颗粒物中重金属的清单[J]. 环境科学, 2016, 37(8): 2823-2835. Liang Xianmeng, Song Jinming, Duan Liqin, et al. Source identification and risk assessment based on fractionation of heavy metals in surface sediments of Jiaozhou Bay, China[J]. Marine Pollution Bulletin, 2018, 128(2): 548-556.